Epistemology of Earthsea: Is The Universe A Machine? 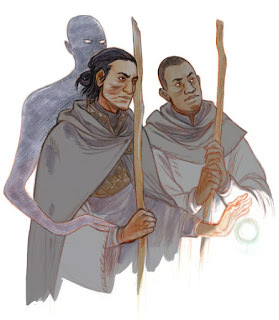 Above, two characters of the Earthsea world: Ged and Vetch (Ged is the one with the scars on his face). Behind Ged, the Shadow. A wonderful image by Paul Duffield. I propose here a modified version of a post that I published last year on “Chimeras“. I argue here that all our troubles are epistemological in nature: we don’t know how to find the truth. In the Earthsea series, Ursula Le Guin gave us some hints – although no solution – about this dilemma. Imagine that you have never been exposed to the thousands of years of accumulation of what we call “culture”. Imagine that you are looking at the world with fresh eyes; as if seeing it for the first time. You see all sort of things: people, animals, rivers, rocks, building, mountains, and much more. And you try to make some sense of all that. So, you notice that some things move, grow, shrink, and change shape. There seems to be some hierarchy in this kind of entities; some move fast and some slow, some don’t move at all, but that doesn’t mean they never do (think of a volcano). You could think that all these things have a soul; that, in a way they are like you, there is a certain kinship in all things. If things have a soul, there follows that you can speak to them. To people, you can talk and they talk back to you. Animals won’t talk back to you but they may listen. You can talk to plants, streams, and rocks; who knows? They might be listening. You may well try to convince the sky to produce some rain when you need it. Praying, dancing, offering sacrifices. That’s the origin of what we call “religion”, that’s a very, very old way of understanding the universe. The universe has a soul. It is a soul. It is a definition of God (or of the Gods). But there is also another way of seeing the universe: it is to assume that it is a sort of a machine. A machine is not something you talk to; it is something you act upon. And if you act in the right way, it will react predictably and as expected. So, you may pray to get the benevolence of the soul of a great forest tree, but you may also chop it down with an axe. Predictably, the tree will fall after a sufficient number of chops. You can do the same with an enemy: if you hit his head with a battle axe, the results will be predictable. If you know the functioning of the machine, then you can make it behave as you want to. This is the origin of magic; that some also call “craft”. Finding the rules that things follow gives you power on them. It is the origin of modern science. Religion may be older than magic, but they seem to have been going in parallel in human history. Take one of the oldest Western pieces of literature, the Iliad, and you’ll find Gods appearing on almost every page, but no wizard ever crosses them. Instead, in some of the earliest literature we have, the Sumerians left us plenty of healing recipes where they freely mix invocation to Gods with herbs and other substances that surely had some healing powers of their own. In time, religion and magic diverged more and more to the point that most modern religions despise magic as evil (and some religions despise science for the same reason). Priests may well perform rituals to obtain something for the benefit of the faithful, but they are always careful to state that success or failure is never guaranteed. If you pray God you may ask to be cured of your ailment. If you are cured, then you are supposed to thank God for His benevolence. But if you get worse, then you are not supposed to blame God for that. The divine will is unfathomable and it may be argued that it is your fault because of some sin you committed that made you unworthy of God’s benevolence. Over history, magic took different paths. One was that of the Europan alchemists. They tended to renounce to all the dark incantations of old times and they became true empiricists, originators of what we call the “scientific method”. Their theoretical basis was faulty and they lost a lot of time in tasks that today we recognize as impossible. But they were always in search of things that worked. Modern science is wary of recognizing their role, but the basic idea is the same: the world is a machine: you don’t need Gods to operate on it. And, in a certain way, the daughter of alchemy, science, triumphed. In most of the Western World, people trust a doctor more than a priest; even though they may also pray God to give them a hand, just in case. There is a problem with the universal machine, though. Magic, just as science, has no moral compass: the end result of magic doesn’t depend on whether it is done for a good or a bad purpose. Science-based medicine will cure an evil person just as well as a good one, while the best modern technologies have created weapons that will kill anyone. And this is a big problem especially when science fails – and it does. While you can’t sue priests (or God) for malpractice, you can and you do sue doctors. And modern science has been unable to maintain its promises and it can be seen as an evil form of black magic for having lost control on those that it did manage to deliver; think of nuclear energy while, at the same time, unable to reverse the damage it created in the form of climate change, pollution, and more disasters. Now, let’s go to Le Guin’s series, Earthsea, and see what we can learn from a parallel world to ours. 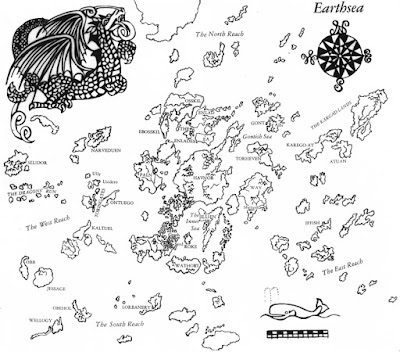 Earthsea is a society nearly fully based on magic, just as our modern world is nearly fully based on science. Earthsea is a machine all based on the “old speech” that plays the same role as mathematical models in our world. This old speech, in other words, is something like an instruction manual for the world machine. Then, the novel describes idealized scientists – portraited as wizards. They are benevolent, crafty, intelligent, and always worried about not doing damage to the equilibrium of things. One wishes our scientists were like that! That allows Le Guin to dissect the dilemmas of science in a variety of narrative plots. The key of the whole series of Earthsea is that even wise mages have problems. One is that they can do very little; we see them mending broken vases, curing goats’ infected udders, raising – sometimes – the ‘magewind’ to push boats onward, and curing human ailments only when they are not too serious. So, wizards are at times considered useless and rejected. One of the stories of the series deals with an age in which wizardry had fell from grace and was widely despised. Just like what may soon happen to science in our world. True, the protagonist of most of the stories, Ged, also fights dragons, but dragons are not the real problem with magery in Earthsea. The problem is the same we have with science in our world: the lack of a moral compass. So, in the first story of the series, Ged’s enemy is not a dragon but himself. And, later on, it will be another mage, turned evil. Over and over, the mages of Earthsea are at loss on how to deal with the Otherworld; the realm of the dead. A realm that’s alien to magic and to science, but that’s the natural domain of religion. So, Earthsea is not a Godless world; it can’t be. We are told that it was created by an entity called “Segoy” who may be is a dragon, or maybe a God. And it is hinted that there is something more; much more than that and at least one region of Earthsea, the Kargad Lands in the North, are described as dominated by a religious vision of the world. Initially, the Kargish are just pirates and barbarians, but then they take up power and importance in the stories, hinting that their view may be on a par – perhaps superior – to their crafty Southern Neighbors. It is like that: Earthsea is a real world, it is alive. Maybe we should just read about Earthsea for the pure joy of doing that. Or, maybe, we can read it in order to learn something about the contradictions and the problems of our world. What’s all our science for? Can it solve problems or does it just create more of them? Can we attain the “balance” that the wizards of Earthsea keep striving for? How can we keep our nuclear dragons for burning all of us to cinders? Can we survive the great transformation that we call “climate change” that was created by our scientists but that our scientists are unable to control, now? What should we do with our dull and arrogant wizards who think they know more than anyone else? Will we ever know if the universe is a soul or a machine? Maybe not. Like Ged in his little ship, the Lookfar, “we beat on, boats against the current, borne back ceaselessly into the past” (*). It is our destiny to follow the great current that’s taking us across the ocean of time to an unknown destination. Or maybe toward Earthsea. (*) For those readers who live in Earthsea and may not have heard of “The Great Gatsby” by Scott Fitzgerald, that’s where the quote comes from. About Earthsea, see also this post of mine on Chimeras. Different way of looking at the universe.